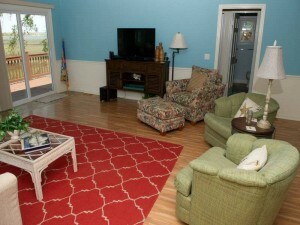 Make a fast getaway to this week’s Featured Property, A Sound Escape. This soundfront cottage features four bedrooms and two full bathrooms, offering a king-size bed, two queen-size beds, a double-size bed and a queen-size sleeper sofa. Island Club Linen Service is provided. Each of the bedrooms is spacious, beautifully decorated and tropically themed. A Sound Escape is the perfect place to get some major rest and relaxation, no matter if you’re lounging inside this rental or enjoying the Sound right in the backyard. If you’re staying indoors, sit back and relax in the beautiful living room where you’ll find plenty of seating, a flat screen TV and views of the Sound. The living room opens right up to the kitchen, which has everything you need to make a delicious meal. You even have a small dining room table that seats six. If you venture outdoors, a real treat awaits you: the Sound is literally just steps away. Guests have access to a private dock, so it’s the perfect location for windsurfing, kayaking (kayak provided), jet skiing, fishing and crabbing. 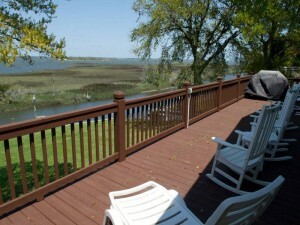 You also can enjoy a large deck with porch furniture including rockers, a swing, picnic table and gas grill. 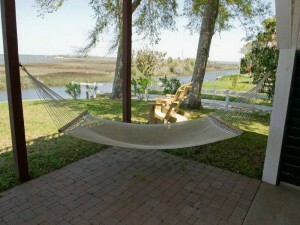 Spend all day outside enjoying the breeze and partaking in all the fun activities this rental has to offer! 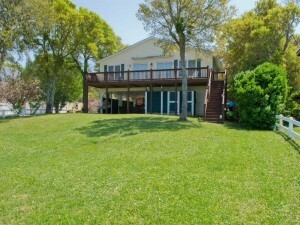 For more information on A Sound Escape, call Emerald Isle Realty at 855-891-1962. View more photos of this cottage here. Be sure to check out our last minute deals and seasonal specials throughout the summer for great savings on vacation rentals!